The global wireless mesh network market is highly fragmented in nature due to the presence of large number of players, states a market intelligence report by Transparency Market Research. The key players of the market are adopting innovative approaches like collaborations, expansion of the product portfolio, mergers and acquisitions to strengthen their market position. Some of the predominant players of the global wireless mesh network market are Synapse Wireless Inc., Qorvus Systems Inc., Firetide Inc., Zebra Technologies, Fluidmesh Networks LLC, and Aruba Networks Inc.
As per the recent TMR report, the global wireless mesh network market would likely rise to US$37.2 mn units by the end of 2024. 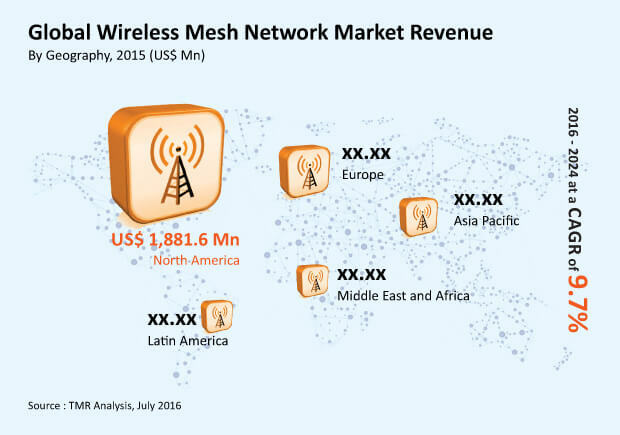 Whereas in 2015, the global wireless mesh network market was pegged at US$13.3 mn units by the report. Geographically, the global wireless mesh networks market is segmented into five key regions, namely North America, Europe, Asia Pacific, South Asia and Australia. Among them, North America is the greatest contributor to the global wireless mesh network market. This is due to the increased adoption of wireless mesh networks in the region due to the several data advantages offered by the wireless mesh network Based on application, oil and gas and mining segment holds maximum potential in the overall market. The increased demand of advanced security and safety system in these two sectors has driven the adoption of the wireless mess network of the two sectors. The growing adoption of Internet of things (IoT) devices has spurred the usage of wireless mesh networks for data sharing and connectivity. Uptake of technologies like Internet of Things (IOT) in the global market is the one factor that has enhanced the growth of the global wireless mess network market. Apart from this, other factors like increased bandwidth requirement, mass adoption of smart phones, and need of a stable network are speculated to propel the growth of the global wireless mess network market. In addition to this, favorable conditions like, reduction in the cost of the connected devices and rising smart cities project in the emerging economies are further estimated to drive growth of the global wireless mess network market throughout the forecast period. Several advantages of wireless mesh networks over the other networks propel the growth of the market across the globe. The global wireless mess network market is taking a hit from the rising privacy and data security concerns. The data concern can be easily overcome with increasing technological evolution in the field. On the other hand, features like government initiatives, cost-effectiveness, easy service maintenance and rising adoption of the advanced networking technologies in small as well as medium industries are likely to offer potential growth opportunities for the global wireless mess network market during the forecast period.